Q1 was a PNP germanium 2N404A, Q2 was NPN silicon 2N3565. Unless you're particularly bothered about it being true to the original, I'd just experiment with whatever you've got and choose your fave. Incidentally, if you want to save a bit of space and aren't bother about using the axial 47uF cap, then just use a radial 47uF between the bottom and second from bottom rows, negative to bottom row. You should be able to remove a couple of the columns then if you want to. What do the diodes say on them? does in matter? Sorry, I am somewhat of a newb to this. Thanks! And what are the little red things? Thanks.........And the little thing that says "100p"?...............Sorry for so many questions, this is the first pedal I have built, and I want to get everything correct on it. and i am assuming that the big yellow things are also capacitors. film caps, right? I've been a fly on the wall for a while on your blog and I have to say I love your site. I've finally decided this will be my first pedal build and I've got everything from smallbear and enclosure from the bay on its way now. I do have a question though: on the mad bean "pepper spray" schematic (I'm still learning to decypher those) there's a switch for stock ge diodes, no diodes, and another diode pair. How would I achieve this with your vero layout? This is what I'm wanting: stock ge diodes, no diodes, assymetrical stock ge diodes. I assume if need an SPDT on/off/on switch. I hope my question isn't too elementary. I appreciate your help! Thank you! The included switch is a diode life and so will give you a diode and no diode option. If you want to include a second set of diodes you'll need to use a SPST on/off/on switch and use the top lug for the additional set of diodes. Which you will need to take from a free row on the board to ground. The fifth row isn't being used for anything so I'd suggest there, but you may need to add an extra couple of columns to accommodate the diodes. Then just connect the top lug of the switch to that row somewhere. Is that what the switch on the layout is for? That is the only part that is confusing me! 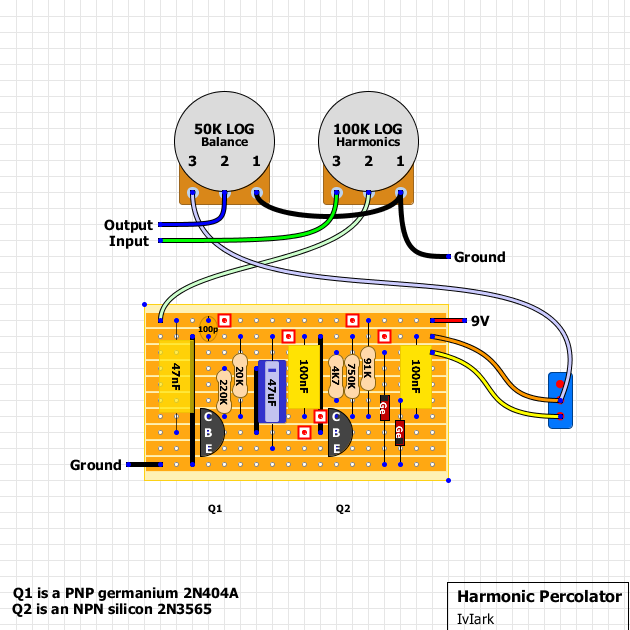 It's just a addon to put the diodes in or out of circuit to give you a couple of different sounds. If you don't want to use it just omit the switch and the other wires, and take the orange wire straight to lug 3. Awesome! Ill give that a try thank you!! Got it finished finally after trying 3 times. This is my first pedal build and I'm happy with it! A bit on the dark side but that's my style and I dig the "gargley" fuzz it has when it's cranked! Didnt use the LEDs it sounded the exact same (to me) as the non-diode position. I ended up putting 4148s in there and it seems to bring a slight sparkle to the high end. Either way thanks for your help guys. Can't wait to build another pedal from here!! what sort of switch is it? what could I use instead of the 2n3565 can? Any NPN silicon transistor will do. The 2N3565 is shown in the datasheet to be between 150 and 600 hfe, so maybe the 2N5088 will be a good alternative. If you use that you will need to rotate them 180 degrees to the orientation shown in the layout. Hello IvIark! Compared to Madbean's layout in this one lacks some 1uf capacitor... but then, googlying, i realized there is a lot of schematics for this one, and learned the story about the mysterious hidden components. Even there is an "Albini" version, which is, they say, the measures of the original Steve's Percolator. 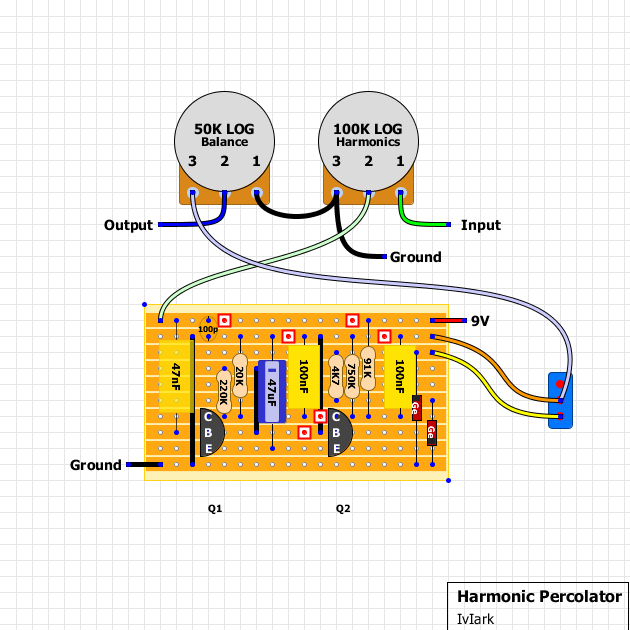 then i promise to share conclusions with all of you, percolators fans. okay, i used 1n695's (i think, whatever the original used) and I get a huge difference between diodes in and diodes out of the circuit. i like both sides (i even like having the transistor flipped- which apparently there is some question on which way the 2n3565 goes- one way is much higher gain one way is lower) when i have the 2n3565 flipped to higher gain and the diodes IN the circuit I get an annoying white noise in the background. I'm wondering if putting this in an enclosure could possibly help- or if i have some bad nos diodes or somethin? any ideas? contemplating putting 2x 2n3565s on a 3pdt to switch between transistor orientations! you're going to get a big difference with the diodes in or out, especially if you're using Ge diodes, because when they clip your signal, you're going to loose output, and the lower the forward voltage the less output you'll get when engage. if you check out a video of the black arts pharaoh, you'll see what i mean as there's a switch between Si, Ge, and no diodes and you can tell the massive difference it makes. as far the the way the transistor is inserted, i would just insert it the way it's shown on the layout, as if it's been verified then it's good to go. i know some circuits will act differently if you place the transistor in backwards and still work, others will not. i haven't read anything about how it's supposed to be orientated, but i would trust the layout. also, i don't think putting it in an enclosure will change the white noise. in my experience a lot of older fuzzes, especially Ge ones will have some background hiss/white noise. it comes with some older components, and it's just the nature of the beast. have you completed this build from this layout? I know that putting clipping diodes in a circuit will lower the volume. i just think this situation is weird. i've now tried modern germanium diodes and its still there. with the harmonics knob i get a ton of weird static noise (not white noise- sorry for the discrepancy) between like noon and 3 o clock on the harmonics dial. below 50% and near maxed out i dont get this noise. its like if i touch a string i get a little burst of this strange staticy noise. I've double checked all my components- i would initially think this is a transistor problem, but considering its only happening when the diodes are in the circuit i'm unsure. i haven't built this yet, but it's on my build list. i can tell you that if a layout is listed as verified, it will work right if it's built as shown in the layout. that is kinda odd though about the diodes. did you try other Ge diodes besides the 1n695? it might be the forward voltage of the diodes causing the problem. @callum hulsmeier my answer was to add a 1n cap in parallel with the diodes to ground. Some of the schematics out there have this written. It solved the sputtery/static/velcro clipping noise in my build. I also added a 1n cap from Q1 collector to ground (in parallel with the 20K resistor that is already there) this is a cap that is missing from this vero layout by iviark but is in a lot of the schematics out there including MadBean's 2018 version and the "albini" version. This cap stabilized the clipping a bit and also gave me more fuzz gain from the transistors themselves (with or without diode clipping engaged.) Hope this helps any future builders. Sweet! I just found some 2N404s in a box of organ innards. Maybe I can find some germanium diodes in there as well. Is there any way to identify diodes? There are a bunch in this box of organ innards, but I don't know how to tell what they are. This pedal is going on my list. I'll try it with a 2N5088 for the silicon and see how they play together. If I don't want to include the diode switch, would I just connect those two wires and send them to the 3rd terminal on the balance knob? It looks to me like you would need to move the output of the furthest right 100nf down one row so it lines up with the diodes and run the orange wire from there directly to lug 3. Further up in the thread is says to just take the orange wire to lug 3 but this appears to miss the diodes. Can someone verify this for me? Has anyone figured out the trick to get the sub octave? I'd really like to know why it happens and how. I've tried many different versions, 47uf alternate values, different hfe germanium, and trimmers on just about every resistor to no avail. There is a guy on youtube who has the best sounding version with sub octave I've heard, latent lemon audio, and he has a trimmer that controls where the octave start to appear. I've read somewhere that the 20K to ground from Q1-C can control octave down if you lower it. If I want to use electrolytic caps for the big yellow ones, how would they be oriented? I see above in another person's comment that you said the 47uF would be negative to bottom row, but what about the 100uF's? The yellow caps are nf, not uf. They are non-polarised. Built this using an AC128 and a BC107. Had a lot of oscillation and microphonics that were subdued by boxing it up. Not much volume without the pots maxed but some good settings definitely. Used a C100k pot for the Balance. Ge diodes, not sure what type. Hi all--Looking for a simple way to boost the overall output, so I can get a volume boost when kicking it on even with the diodes engaged. Is there any simple way to do this? 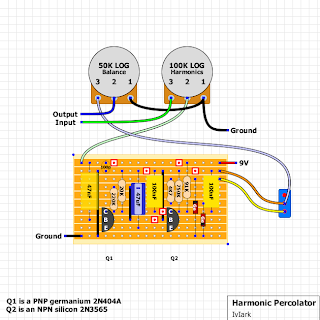 How would I go about adding a a third clipping option for diodes. I read the comments earlier on this but it appears that the board needs to be expanded. Is there a way to do this with the existing build, either with the SPDT switch or a 2 or 3 pole switch? Eh? Vero layouts at Tagboard Effects?